SAN DIEGO — The Giants left several injured players at home when they flew here Sunday, knowing that the visitors clubhouse at Petco Park couldn’t hold a full September roster. But Hunter Pence made the trip, eager to keep working toward what at first seemed like an unlikely return. The Giants hope to get Pence back when they return to AT&T Park next week, and Pence is doing his best to keep another brand of hope alive in the clubhouse. What was the Reverend’s latest message to a team that looked dead in the water? The Giants remain six back with 12 to play, but they’re in a much better position than they were in over the weekend. They have picked up ground on the Dodgers on three consecutive days and continue to hold out hope that they can chip another game or two off the deficit before a four-game series at AT&T Park that begins Monday. “Until there’s an ‘E’ by our name (in the standings), 100 percent it’s doable,” reliever George Kontos said. Kontos played a huge part in Tuesday’s festivities, stranding the bases loaded in the fifth by getting Matt Kemp and Justin Upton to pop out and fly out, respectively. First came Kemp, and Kontos briefly flashed back to past encounters. 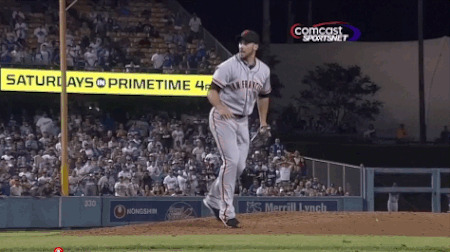 Kontos struck Kemp out in a huge spot near the end of the 2012 season, helping the Giants beat the Dodgers in Los Angeles. “That always kind of sneaks back into the back of my mind,” he said. Next came Upton, who entered 0 for 10 in his career against Kontos. On a 3-2 pitch, he skied a fastball deep to left-center. Angel Pagan and Alejandro De Aza inserted some drama into the moment by nearly colliding, but the ball was caught and Pagan took much of the drama out of the rest of the night with a two-run homer to right. At the same time, the Dodgers gave away another game started by a pitcher not named Kershaw or Greinke. The two will start six more times down the stretch, making the math a bit more impossible for the Giants, but on Tuesday night, this task seemed just a tad less daunting. Bochy’s cockroaches are back within six games for the first time since Sept. 1. On this night, that was enough to bring smiles to faces. --- Chris Heston said this was about as good as his stuff has been all year. He struck out six in the first three innings. This definitely was an encouraging outing for Heston. He’ll learn to put some guys away a little quicker, but the stuff is plenty good enough to plant him in a big league rotation. He had issues in recent weeks getting out of the first inning, but he cruised early on tonight. --- Brown took a shot off the throat early and was dizzy as he walked out to see Heston, who called for the trainers. He ended up being just fine, and he picked up his first career hit and RBI on a hard double to center. He also continued to show that he’s a pretty solid defender behind the plate and the arm is a strong one.